The hypothesis of the dependence of fundamental constants on the global distribution of matter in the Universe is discussed. 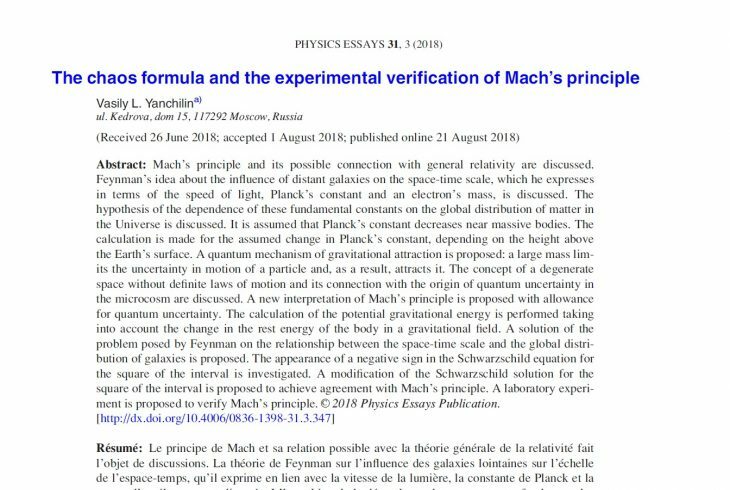 Vasiliy Yanchilin’s paper The chaos formula and the experimental verification of Mach’s principle was published in PHYSICS ESSAYS 31, 3 (2018). Journal is included in the Emerging Sources Citation Index (ESCI), a new edition of the Web of Science (http://mjl.clarivate.com/cgi-bin/jrnlst/jlresults.cgi?PC=MASTER&ISSN=0836-1398), as well as in the Research Alert Service. Physics Essays has been established as an international journal dedicated to theoretical and experimental aspects of fundamental problems in Physics and, generally, to the advancement of basic knowledge of Physics. The Journal’s mandate is to publish rigorous and methodological examinations of past, current, and advanced concepts, methods and results in physics research. Physics Essays dedicates itself to the publication of stimulating exploratory, and original papers in a variety of physics disciplines, such as spectroscopy, quantum mechanics, particle physics, electromagnetic theory, astrophysics, space physics, mathematical methods in physics, plasma physics, philosophical aspects of physics, chemical physics, and relativity.